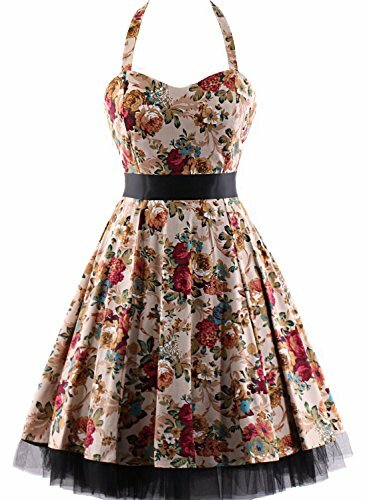 Vintage dress sewing with halter design,perfect for cocktail party,summer outdoor,garden,picnic,and Rockabilly prom evening. ✔Retro rockabilly dresses,bottom with black lacy hem, elasticated back bodice to be more fitted. ✔Removable silky ribbon,you can decide to use it or not as per your dressing. ✔It can be dressed with or without a petticoat or underskirt as you like. -Without a petticoat,it is retro and vintage,very nice as a sun dress for the daily dressing. -With a petticoat, It will be more flair and that's definitely a rockabilly vintage and pinup dress. Garment care: Machine wash or hand wash, please don't soak the dress in water for a long time.Low temperature ironing before wearing. Description: Clothes to love and be loved in.